Building a bed wood sub frame designed to raise the boards is an easy way to clear the rear end housing of a lowered truck. Whether your slammed truck is equipped with a big C-notch in the frame rail, a raised set of rear rails or even a serious Z’d frame, these frame modification are all made to clear the top of the rear end housing when the chassis is dropped to the ground. Trouble is, the housing is going to strike the bottom of the bed unless you perform some sort of fabrication to create clearance between the bottom of the bed and housing. I have seen all methods of bed modifications designed to clear the pumpkin of a dropped truck from formed sheet metal to leaving it open or even wood boards that look like a berm. Few if any are as clean and simply as creating a sub frame designed to raise the bed wood planks high enough to clear the rear end. 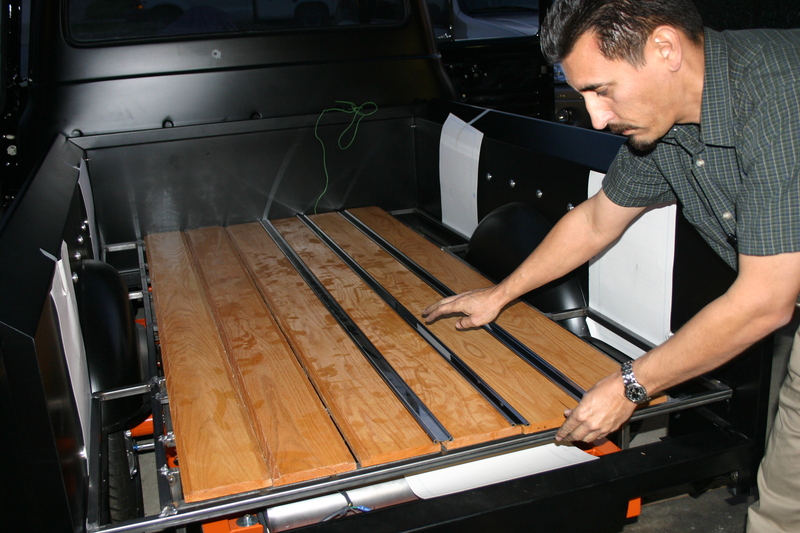 There are two drawbacks; you will lose four to five inches of bed depth which could prove to be a problem when storing a tall ice chest or luggage, and you will have to create a custom rear panel since the bed wood will not be flush to the rear bed brace. Since I was no longer planning to use my F-100 to haul refrigerators, neither dilemma seemed to be an obstacle to this install. 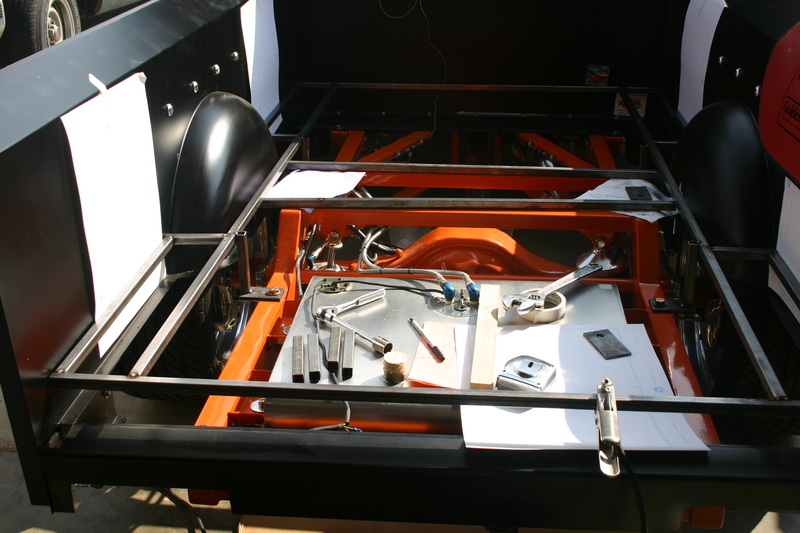 You will need a light duty welder, ½ or ¾ inch square tubing, flat bar stock, bolts, a helper and a plan. 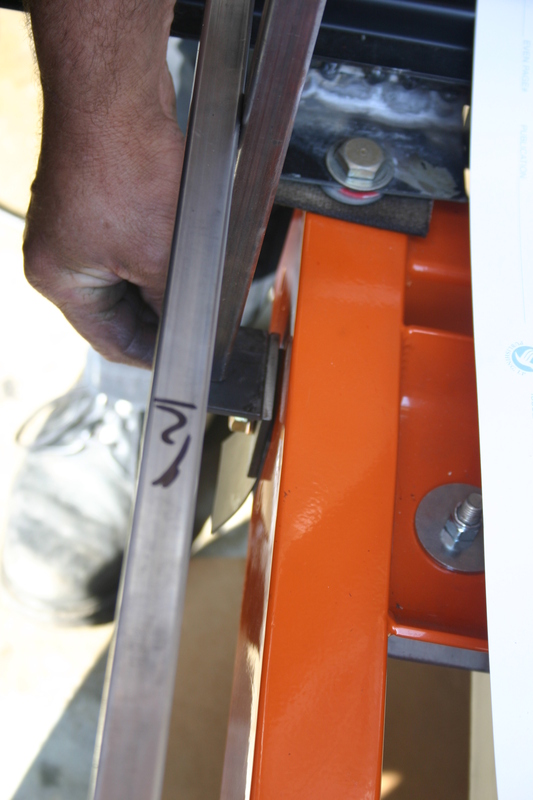 The key to the fabrication is to match the metal beds inside measurements, including a small gap for clearance. 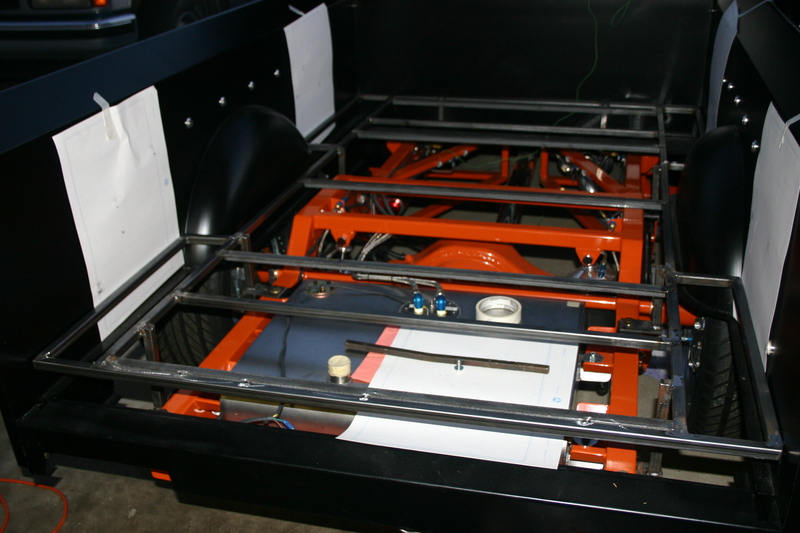 Once you have the frame mapped out, figure out where and how you will support this bed frame just high enough to clear the rear end housing which will be between four and five inches. 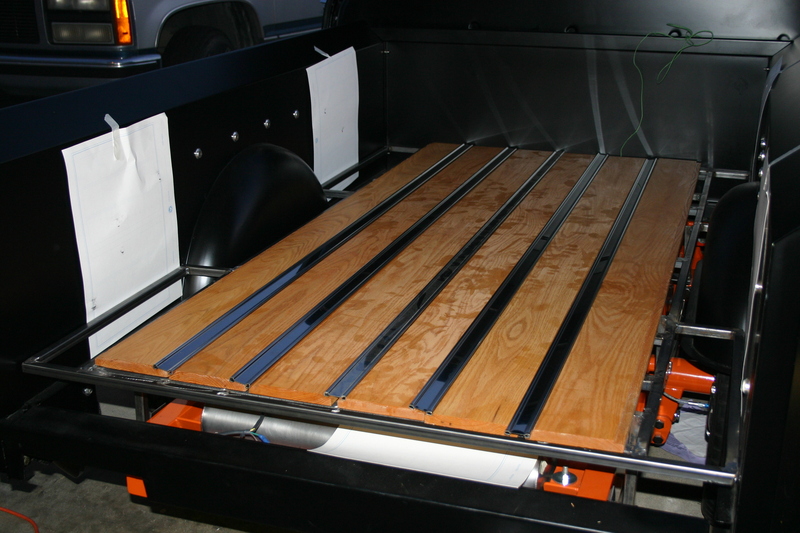 Once the red oak bed wood from Bruce Horkey and the polished stainless steel bed strips and stainless hardware were in place, the truck took on the totally show truck look, without danger of being bumped by the bouncing rear end. Not show in the photos is a formed piece of aluminum which blocks off the rear of the bed since there will be a gap from raising the wood. The kicker is, I haven’t had one person notice that the bed is actually shallow, but have had comments on how clean the wood covers the rear end! 1- There are numerous options when it comes to clearing the rear end housing of an extremely lowered truck, but none that I know of that delivers such clear results. Larry “Spraycan” Lopez positions the red oak boards from Bruce Horkey along with stainless steel strips from Mid-Fifty. As you can see, we will have to add a rear panel to fill the gap of the raised bed wood. 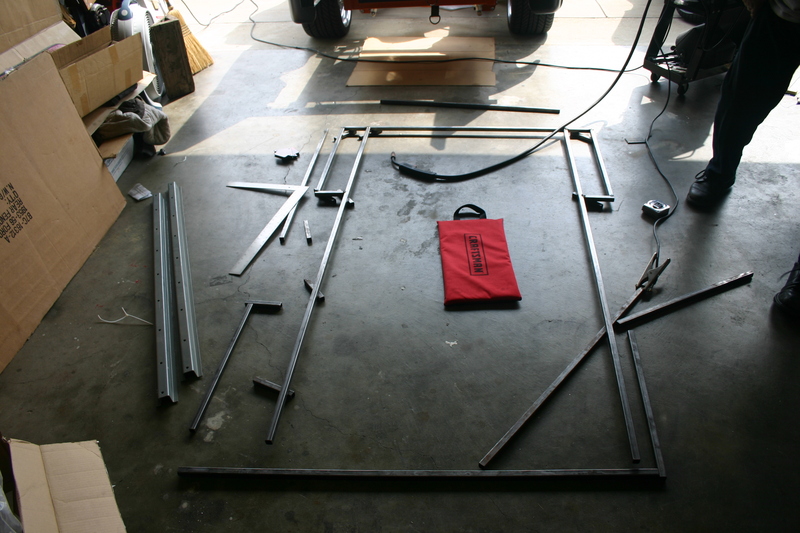 2- I purchased sticks of ¾-inch square tubing to be used to fabricate the bed wood’s sub frame. Bill Lee was there to help as we cut sections of tubing to fit around the wheel tubs and run front to back and side to side. We tack welded the corners just to get started. 3- After checking the bed to ensure it was totally square, we squared up the first corner of the tubing in preparation to welding it in place. 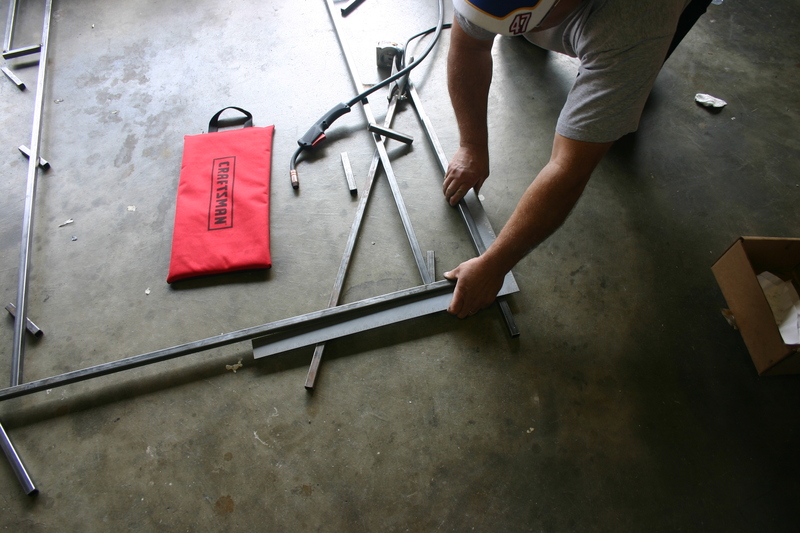 A light-duty Miller MIG welder works great for this type of metal fabrication. 4- The main rails which run the full length of the bed are next to be installed. 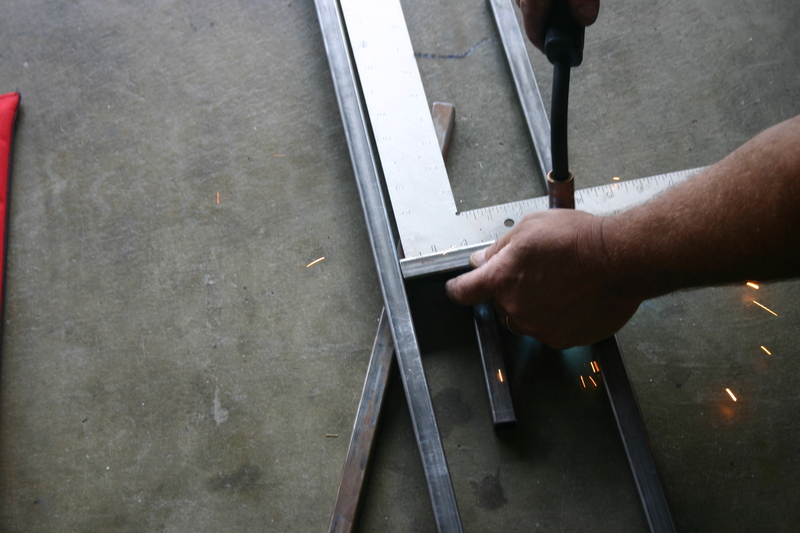 A framing square works great to ensure this frame work will fit and ensure it runs parallel to the bed. 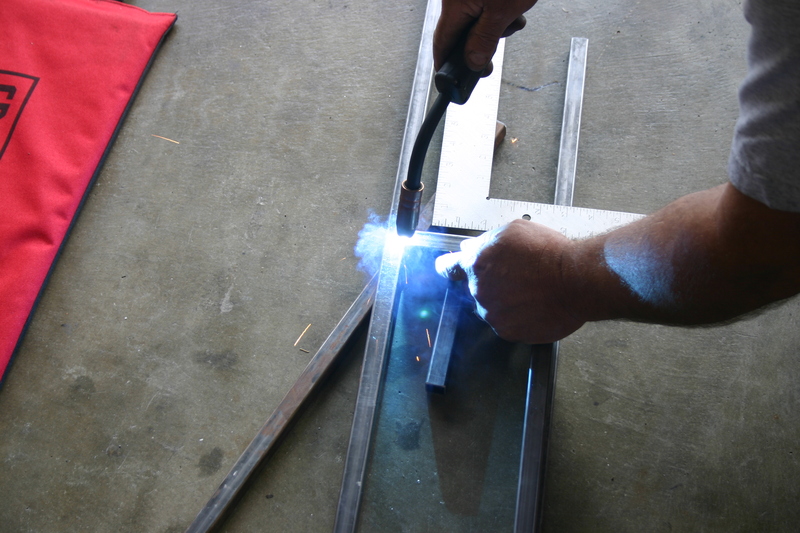 5- Best part of using a light-duty MIG welder is the ability to use it with a standard 3-prong plug. The MIG uses a tank of Argon gas which also eliminates welding spatter, so there is very little clean-up. 6- Critical to the fit of the bed is the creation of stanchions which will make the bed boards high enough to clear the frames stepped rails as well as ensuring the bed boards remain level. 7- Poster board was taped to the bed side to ensure the frame rails did not scratch the painted bed sides as the rails were adjusted for fit and leveling. You also get a good look at the supports which are tack welded into place, being just long enough to place the framework higher than the frame. 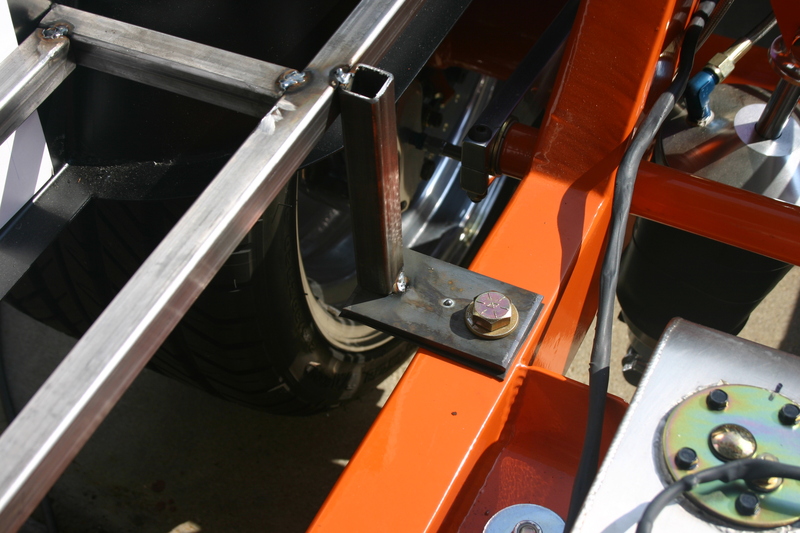 8 – Taking advantage of the rear frame bolt holes, a flat, square of metal was bolted into place on both sides. 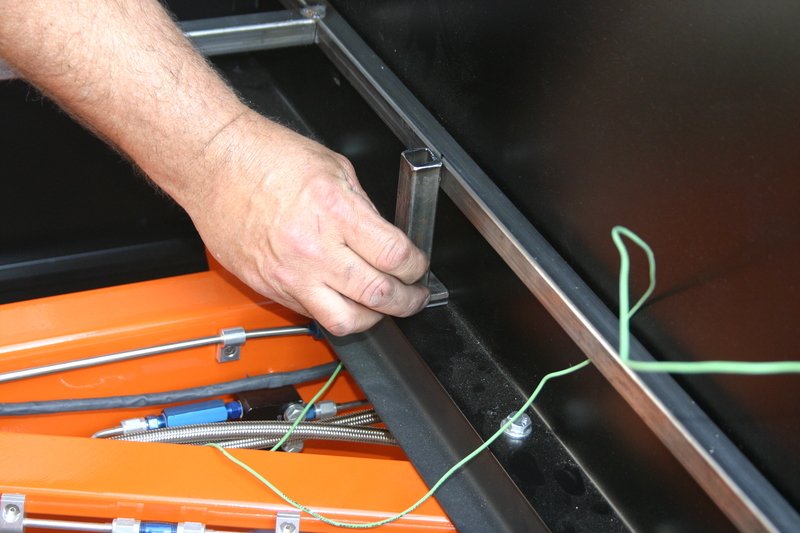 A short section of square tubing was then placed to form a support strut for the rear of the bed frame. Again, it is just tack welded at this time. 9- Another flat plate was mounted to a bed bolt and a support strut cut to fit from the plate to the height of the bed frame. This one is just forward of the wheel tub for added support. 10- Another vertical support strut was added to the very front of the bed frame and it now became rigid enough to actually walk on…not that we would tempt fate. This is where those poster boards paid off as we removed the bed sub frame to finish weld it outside of the truck to ensure against damage to the bed’s paint and powder coated chassis. 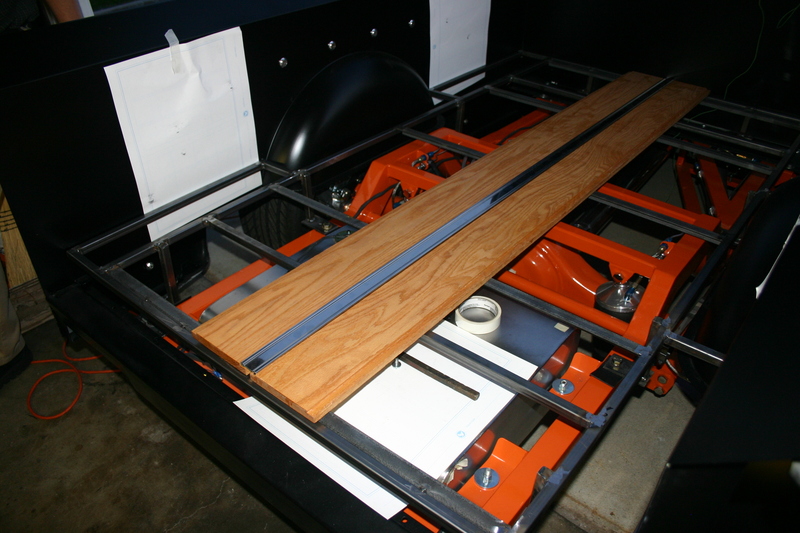 11- With the bed’s sub frame finish welded, the welds were ground flat where they would be flush when touching wood. The frame was then reinstalled into the truck’s bed and bolted in place. A thread locker was used to ensure the bolts would never back out. 12- A test fit of the truck’s bed wood indicated we had performed a flawless job of raising the bed wood high enough so the truck’s rear end would never bottom out against the boards. Last work to do is to fit the outside boards around the Dan Carpenter bed tubs and create a rear seal for the gap created by the raised bed. Blind bolts were used to mount the boards and retain the stainless bed strips. This procedure takes time but is one heck of a lot better than having a big bump in the middle of the bed.